This is a special model, produced within the USMC, for their Marine Expeditionary Unit (Special Operations Capable MEU(SOC)). The Marines didn't like the M9 pistol very much, so they went ahead and used their internal expertise, to come up with a pistol suitable for the needs of their elite units. The pistols start out as a stripped government M1911A1 frame, as manufactured up until 1945 or so. The frame is inspected, and the feed ramp polished and throated while the external areas are is dehorned. Internal parts include : King's beaver-tail grip safety and ambidextrous thumb safety, Videcki aluminum Match triggers (tuned to a pull of between 4-5 pounds), Colt Commander hammers, either Caspian and Springfield slides with forward slide serrations, Bar-Sto barrels, King's barrel bushings, King's stake-on front sight, an in-house custom-made rear sight, lowered and flared ejection port, fiber recoil buffer (GOOD LORD!! ), flat mainspring housing, lanyard loop, Pachmayer rubber grip panels finish out the package. There is no checkering on the MEU(SOC) pistol. The pistols are delivered with Wilson-Rogers 7 round stainless magazines, which are carried in Eagle pouches on the belt, and in a piggyback pouch on the load-bearing vest. The pistol itself is carried in a Safariland tactical holster (usually models3004 or 3005). Here you can read a report from FULL-AUTO.COM, from someone who had fired this pistol. And here is a .pdf file with the MEU-SOC Technical Manual, as issued by the USMC. 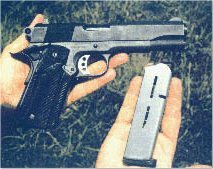 The pistol shown below, is an effort to create a cheap (and easy to make) 1911 from sheet metal. These pistols have been used in the Vietnam war, and this particular one has been brought back to US, by a member of our Forums Site, Johnny Peppers, whom I have to thank for these pictures. It's amazing that people fired those pistols and lived to describe their experience! Here is a picture send to me by a French friend, of a 1911 chambered for the odd 455 Webley cartridge. Interesting gun, although why British went to this caliber is not apparent to me. Caspian Damascus 1911 Pistol built by hobby-gunsmith Eddie from Washington. Built on a Caspian Frame with the Caspian Damascus Steel Slide. Sights are BoMar adjustable. All remaining parts are from Wilson Combat. With guidance and coaching from Angie Butrick (aka "The Sightman"). Slide acid etching done by Master Gunsmith Gene Shuey. This gun is produced in South Africa and distributed in the USA by First Defense International . The gun features eight ported slots on the slide (and the barrel I presume) and is available in blue, satin-chrome or (!!!) gold-plated finishes. Price is around $465. These are Nazi produced pistols of the 1941-42 (top) and 1945 era. Possible production place is Norway. The lower gun has the Waffenamt stamp on it. A noticable difference on these guns, is the slide stop, which has a protrusion to facilitate its operation. These guns are a pair of Kongsberg Colts. The Kongsberg Colt (Also Kongsberg Colten) is a name used for Colt M1911 pistols produced under license by the Norwegian factory Kongsberg Vaapenfabrikk. The production at Kongsberg Vaapenfabrikk in Norway started in 1916 and 95 pistols were finished in 1917 and wrongly stamped "COLT AUT. PISTOL M/1912" These pistols were identical to the Colt M1911 except for a minor detail on the hammer checkering. 100 pistols were ordered, but 5 were rejected during production. The serial range was from 1 to 95. Number 1 is in Bady's book " Government Models" and number 2 was stolen from the The Norwegian Armed Forces Museum in 1978. Kongsberg Vaapenfabrikk was ready to start mass production in 1919 and some new changes were made. The slide-stop was extended down and back to make it easier to operate. This change required a cut-out in the left stock. The new version had the left side of the slide stamped "11.25 m/m AUT. PISTOL M/1914." that was correct as the approbation of the gun was in 1914. Production went on, but from 1929 to 1939 the production was very low, only 871 were made (approx 20,000 pieces were made before 1940). 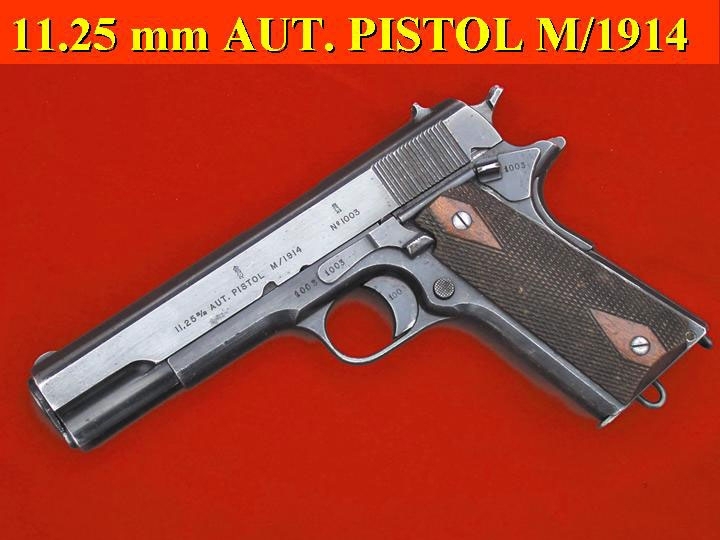 During the German occupation of Norway (1940-1945), manufacture of the pistol, given the designation Pistole 657(n), was continued under German control. The Waffenamt acceptance mark (WaA84) was added in 1945 and only those 920 pistols produced that year were ever Waffenamt-marked. Its not likely that any of these Waffenamt-marked pistols ever saw any action during World War II as the first one, serial# 29615, was delivered March 29, 1945 and the last one, serial# 30534, was delivered in May 1945 just before liberation of Norway. Approximately 8200 pistols were made during German occupation. All of them were delivered to AOK Norwegen (Army) except the 700 that were delivered to Maza Norwegen (Navy). Production ended in 1947 and 32854 pistols were made in total. All the original parts was stamped with the serial number of the pistol. When the serial number was getting to long, it was shortened with a . in the beginning. An example is .2011. Here is a picture of a Norwegian 1911. I finally found out who built this model, thanks to Yuli Barcohen, who was kind enough to tell me. Thanks Yuli. The gun was produced by Alan Tillman and it is owned by Karl Rehn, who maintains a nice handguns page. A nice gun, by Sam Trevino of SPT Armament, Chino Valley. A very nice high-capacity Officer's sized gun, by Custom Pistolsmith Mark Morris, of Morris Custom Pistols. , using a Strayer-Tripp frame. Javelina is a 10mm long-barrel gun, by Irwindale Arms Incorporated , based on the Colt Gold Cup, but having 2 more inches of barrel length (and sight radius). The compact version of the famous Detonics pistol. A six-port compensator is not a very usual item. This gun is made by Ferris. Another gun by Ferris, with a C-thru optical sight. Two guns by Safari Arms. A very good elementary gun, by Norinco. Exact M-1911 clone, good base for customization. A European M-1911 clone, by Llama. I was not 100% sure if these guns are exact clones though, and I was right. Read Ross Robinson's report about which parts are interchangeable. Another picture of this controversial issue. The picture has been supplied by Chris Chaffee evergren@rand.nidlink.com, a professional photographer and friend. A lovely little Pitbull, courtesy of Steve Culp. 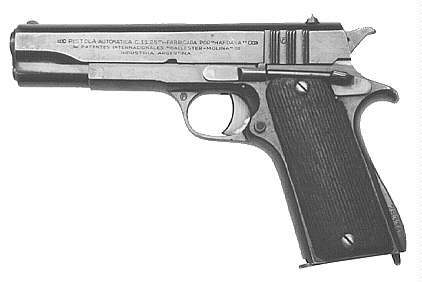 An Argentinian close copy of the M-1911 is this Ballester Molina. It does without the beavertail safety of the original. I do not know anything about parts interchangeability. Manufactured by Hafdasa of Buenos Aires, Argentina. Thanks for the pictures Mike.